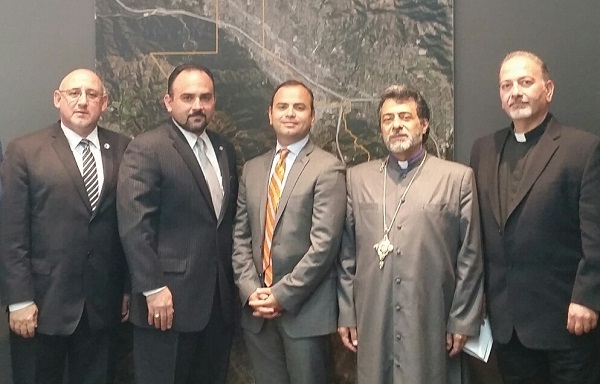 GLENDALE, Calif. – Representatives of the Armenian Genocide Centennial Committee – Western USA (AGCC – WUSA) met on Monday, Sept. 29, with Glendale Mayor Zareh Sinanyan and City Manager Scott Ochoa to initiate the process of locating the Armenian American Museum of California in Glendale. “The 100th Anniversary of the Armenian Genocide presents an opportunity to transform the experience of the survivors of the Armenian Genocide and generations of Armenian Americans into a vehicle for preserving liberty and equality in a democratic society,” stated AGCC-WUSA Co-Chair Garo Ghazarian. His Eminence Archbishop Hovnan Derderian, Primate of the Western Diocese of the Armenian Church of North America, informed the Mayor and City Manager that the organizations represented on the Centennial Committee had unanimously decided to establish a world-class museum in Glendale. The Native American Museum, La Plaza De Culturas Y Artes, the California African American Museum, the Chinese American Museum, the Japanese American National Museum, the Skirball Cultural Center, the Museum of Tolerance at the Simon Wiesenthal Center, the Italian American Museum of Los Angeles, the Korean American National Museum and several other museums based in Southern California every year educate thousands of youngsters and visitors in the rich ethnic and cultural diversity of the region. “Our Landmark Sub-Committee has devoted hundreds of hours on research and planning over the past 10 months for the identification and development of an initiative to strengthen our communities and increase respect among all residents,” added the co-Chair of the AGCC – WUSA Talin Yacoubian. His Eminence Archbishop Moushegh Mardirossian, Prelate of the Western Prelacy of the Armenian Apostolic Church of America, expressed the Centennial Committee’s commitment to this initiative because the legacy of Armenian Americans will serve to advocate for justice and a better world. “In the coming weeks, the Centennial Committee will organize presentations, town hall meetings group discussions, and a website to engage the public in the development of the museum,” remarked Secretary of the AGCC-WUSA Lena Bozoyan. The Armenian Genocide Centennial Committee – Western USA helps guide and coordinate events and activities to observe the 100th Anniversary of the Armenian Genocide. The representatives of the following organizations and institutions serve on the Armenian Genocide Centennial Committee – Western USA: Armenia Fund – Western Region USA; Armenian Assembly of America; Armenian Bar Association; Armenian Catholic Church; Armenian Council of America; Armenian Democratic Liberal Party; Armenian Evangelical Union of North America; Armenian General Benevolent Union – Western District; Armenian National Committee of America – Western Region; Armenian Relief Society – Western USA; Armenian Rights Council; Armenian Revolutionary Federation; Armenian Youth Federation; Ignatius Foundation; Organization of Istanbul Armenians; Social Democratic Hunchakian Party; Unified Young Armenians; USC Institute of Armenian Studies; Western Diocese of the Armenian Church of North America; Western Prelacy of the Armenian Apostolic Church.